Within “History against the Pagans” Book 1, chapters 1 and 2 are an inventory of the oikoumene as known to the early Christians. That said, it is not a geographical treatise as such but a record of knowledge available to clerics of the early Church. Paulus Orosius was born in Iberia and travelled the North African littoral, and thence to at least Palestine. He was well read and it has been shown that he used the texts of Julius Caesar, Livy, Justin, Tacitus, Seutonius and an unknown cosmography which could have been corrupted from the original texts of Strabo or Pliny, but not that of Marinus/Ptolemy as the data is incompatible. The information is well presented and now analysed in text order. Paragraphs are my numbers. BOOK 1, CHAPTERS 1 AND 2 WITH PARTS OF CHAPTERS 3 TO 21 AS REQUIRED. C1/4; I shall, therefore, speak of the period from the creation of the world to the founding of the City, and then of the period extending to the principate of Caesar and the birth of Christ, from which time dominion over the world has remained in the hands of the City down to the present day. So far as I can recall them, viewing them as if from a watchtower, I shall present the conflicts of the human race and shall speak about the different parts of the world which, set on fire by the torch of greed, now blaze forth with evils. With this in mind, I believe I must describe first the world itself, which the human race inhabits, how it was divided by our ancestors into three parts, and what regions and provinces compose its divisions. In this way when the theatres’ of war and the ravages of diseases shall be described, whoever wishes to do so may the more easily obtain a knowledge not only of the events and their dates but of their geography as well. The dates given are a little awry. In C1/P2 he states that, “But from Ninus, or from Abraham, to Caesar Augustus, that is to the birth of Christ, which took place in the 42nd year of Caesar’s rule—.” Augustus Caesar, was born Octavian c63 BCE, but it is not until c29BCE he attains power. Whether Orosius is conflating the two Caesars is debatable. Or, does he mean from when he was adopted at the age of 19 by Julius Caesar. That is perhaps the only plausible date, but Augustus died in 14CE. The statement, “as if from a watchtower” is a reference to the early Christian writers Valentine and Hermas, where the tower is indicated in parables. An Angel of the Lord, the Glorious Angel, the Son of God or Michael, Lord of the Tower is elementary in these prophetic visions, particularly where the instructing Angel is in the form of a Shepherd. The church appears as a celestial woman and is constructed as a tower. Thus we can, as no doubt we would expect, perceive an overlay of Christian thought upon the text, albeit they are geographical facts (text StM1). C2/1; Our elders made a threefold division of the world, which is surrounded on its periphery the Ocean. be two, that is, Asia, and Africa and Europe, grouping the last two as one continent. This corresponds to the original Greek metaphysical description of the world found in early texts, but Herodotus (see cgHs1) decries this description, although it is continued by Greek geographers well past the dates for the text of Strabo (see Es1 and Es2) by such geographers as Pomponius Mela and Dionysius. If the redrawn maps of those early geographers are studied it is clear that a circular oikoumene and circular surrounding river are paramount. 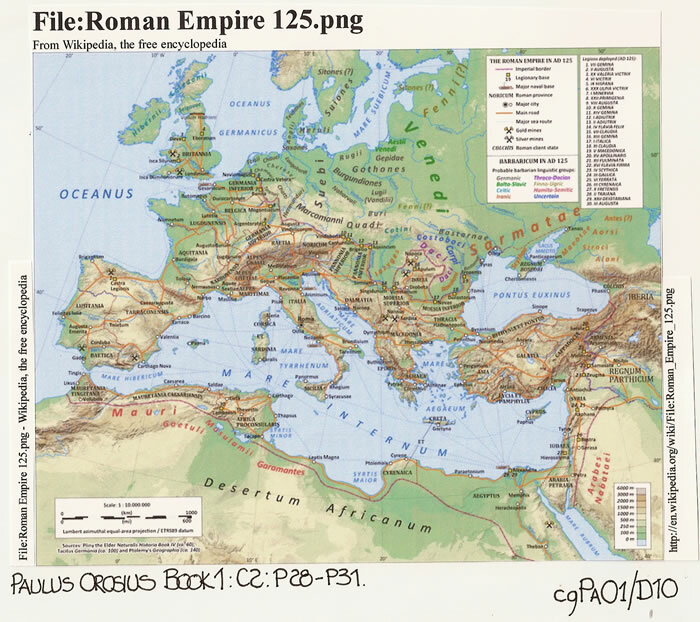 I have shown several examples in the text cgPl2, The Map of Agrippa. Sallust (the War with Jugurtha) writes; 17:3, “In their division of the earth’s surface geographers commonly regard Africa as a third part, a few recognize only Asia and Europe, including Africa in the latter. Africa is bounded on the west by the strait between our sea and the Ocean, on the east by a broad sloping tract which natives call Catabathmos”. it’s right, it touches the border of Europe near the North Pole, but on its left it extends as far as Africa, except that near Egypt and Syria it is bounded by Mare Nostrum, which we commonly call the Great Sea. Here we read the descriptions left and right clearly used for the positioning of the continents when the map is oriented normally but Orosius is viewing it for his description from the East. It is as if he has turned a normal map through 90 degrees to place the East at the south point. Thus the description could come from a map with a cardinal point other than north at the top of the page or it may just be a rather peculiar methodology by Orosius. Pomponius Mela, Book 1, Chapter 9 (ASIA) states,” Ocean, differing by name as by position, abuts Asia from three directions: the Eastern Ocean from the east, from the south the Indian, from the north the Scythian Ocean. Asia itself, reaching eastward with a huge and continuous coastline, empties its rivers on this end over a coast as wide as Europe, Africa, and the sea that extends between them”. C2/3; Europe begins, as I have said, in the north at the Tanais River, where the Riphaean Mountains, standing back from the Sarmatian Sea, pour forth the Tanais flood. The Tanais, sweeping past the altars’ and boundaries of Alexander the Great to the territories of the Rhobasci, swells the Palus Maeotis, whose immense overflow spreads afar into the Euxine Sea near Theodosia. From the Euxine near Constantinople a long narrow body of water leads to the sea which we call Mare Nostrum. The Western Ocean forms the boundary of Europe in Spain at the very point where the Pillars of Hercules stand near the Gades Islands and where the Ocean tide comes into the straits of the Tyrrhenian Sea. The Tanais (River Don) is in most ancient Greek geographical literature the boundary of Europe and Asia. Constantinople was founded c324/330CE, just as Orosius was born. Theodosia is a Milesian colony on the Tauric Chersonesus, Crimea, and is situated under Mount Cimmerius which gives its name to the Black Sea or Pontus Euxine as the Cimmerian Sea. The Mare Nostrum, our sea, otherwise known as the Inner Sea is the Mediterranean Sea. The fact that Orosius considers the Tyrrhenian Sea to stretch to the Pillars of Hercules is somewhat surprising. Mela states in B1/C15, “For the terminal points Europe has the Tanais, the Maeotis, and the Pontus in the east: in the west the Atlantic; to the north the Britannic Ocean”. C2/4; Africa begins with the land of Egypt and the city of Alexandria. On the shore of that Great Sea, the waters of which touch all the continents and the lands in the centre of the earth, we find the city of Paraetonium. From there the boundaries of Africa lead through districts which the inhabitants call Catabathmon, not far from the camp of Alexander the Great above Lake Chalearzus, whence they pass near the lands of the Upper Avasitae and across the deserts of Ethiopia to reach the Southern Ocean. The western boundary of Africa is the same as that of Europe, that is, the entrance of the Strait of Gades; its furthest boundaries are the Atlas Range and the islands which people call Fortunate. Many writers state that the Nile is the boundary of Africa and Asia, but Herodotus in c440BCE commented that this was wrong as it negated the land east of the Nile to the Red Sea (Arabian Gulf). By stating Alexandria, which is to the west of the Nile, Orosius appears to be perpetuating the ancient boundary and it indicates he probably never read the text of Herodotus as his argument regarding this boundary is quite forceful. The ancient cities of Libya/Egypt are noted upon the diagrams and can be found in texts Es1 and Es2 as well as cgHs1. The Fortunate Islands are the subject of some controversy. It is apparent that in some texts they are regarded as the Canary Islands off the west coast of Africa and opposite the Atlas Mountains. But in other texts where they are referred to as the Prime Longitude they in fact should be named as the Cape Verde Islands which are much further south (see text Cp4). Mela states in B1/C20, “Africa, terminated to the east by the Nile and everywhere else by the sea, in fact has a less extensive coast the Europe, because it never extends opposite to Asia, and because it does not extend directly opposite to all of Europe’s coastline”. 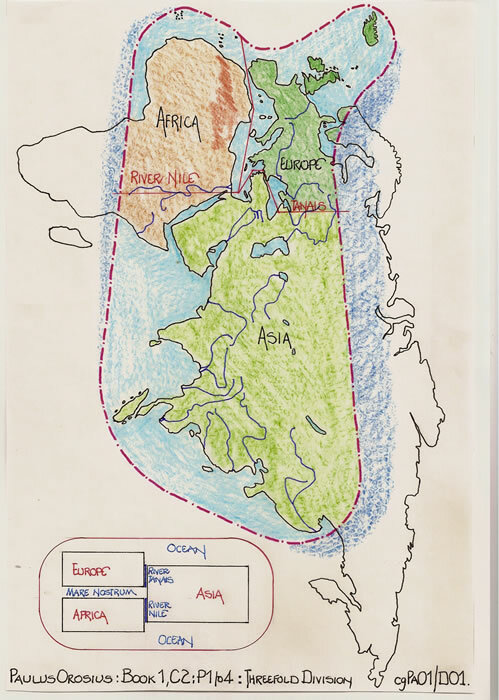 C2/5; Now that I have given briefly the three great continents of the world, I shall also take pains, as I promised, to point out the divisions of the continents themselves. C2/6; Asia has at the centre of its eastern boundary on the Eastern Ocean the mouths of the Ganges River; to the left we find the Promontory of Caligardamana, to the southeast of which lies the island of Taprobane. From this point the Ocean is called the Indian Ocean. To the right of the Imavian Mountains, where the Caucasian Chain ends, we find the Promontory of Samara, northeast of which lie the mouths of the Ottorogorra River. From this point the Ocean is called the Serian Ocean. This paragraph is incomplete as a description of the Far East. In paragraph C2/16 the littoral is expanded further north and a clearer picture of the whole area emerges. In fact it is a very poor description, as having reduced India to a promontory called Caligardamana, and stated that the Ganges is at the centre of the eastern boundary, it has conflated the various promontories of the Far East. Therefore it is necessary to conjoin the two paragraphs and then investigate the actuality. C2/16(part); From the source of the Ganges River to the sources of the Ottorogorra River on the north, where lie the Paropamisadae Mountains, we find the Taurian Range. From the sources of the Ottorogorra to the city of Ottorogorra between the Chuni Scythians and the Gandaridae are the Caucasian Mountains. The farthest range is the Imavus between the Eoae and the Passyadrae, where the Chrysorhoas River and the Promontory of Samara meet the Eastern Ocean. In the lands that extend from the Imavus Mountains (that is, from the eastern tip of the Caucasian Range) and from the right division of the East where the Serian Ocean lies as far as the Promontory of Boreum and the Boreum River, and thence to the Scythian Sea on the north, to the Caspian Sea on the west, and to the wide range of the Caucasus on the south, there are the forty-two tribes of the Hyrcanians and Scythians, who, on account of the barrenness of the extensive lands of the country, wander far and wide. We may now investigate the form of the Far East as described by Orosius. Commencing with the Caligardamana promontory the form of the Indian sub-continent is taken from a text or description, not a map. Obviously therefore the texts of Strabo/Marinus/Ptolemy were not available to Orosius in writing this section. Neither can we use the Tabula Peutingeriana as a basis for the description as it includes no promontories. But at least the Tabula does have a definitive form which could have given rise to this description with the Ganges in the centre of the East. Therefore starting from the mouth of the Ganges, geographically we have these major features; Irrawaddy River; Salween River; Golden Chersonesus or Malay Peninsula; Mekong River with Oc Eo township; Yangtse River, known as the Golden Waterway of which the Jinsha River or Golden Sands River is a tributary; The Yellow River named from the sediments but probably a toponym unknown in Europe until after Orosius; The Korean Peninsula; The River Amur and lastly the Kamchatka peninsula prior to the continent turning west into the Arctic Ocean. It will be very apparent that Orosius does not in fact state that his text is a list from south to north on the eastern extremity of the continent. In fact he moves from the coast to the interior and back again several times. Thus the Promontory of Samara could be the Golden Chersonesus with the Ottorogorra River, the Mekong, and Ottorogorra City, Oc Eo, a well known trading city on the delta, or the Yangtse or Yellow River. There is information in the ancient Indian texts which possibly support it being the Yangtse as it rises in the Tangla Shan along with the Mekong and Salween Rivers which could in ancient times have been conflated into one source. Much research has been carried out regarding the name Ottorogorra, and it is thought to represent Uttarakuru which probably comprised the north-west of Sinkiang province, China and parts of Tian-Shan or possibly east of Kashgar in the Tarim basin. But the second section of the text intimates a different situation, with the Chysorhoas River and the Samara promontory linked. Various texts have this river and an island similarly named. But at least it is possible to consider the Boreum Promontory as the Korean Peninsula with the Yellow River to its south and the Amur River to its north. The early civilisations of China tend to be south of the Korean Peninsula with later expansion inland to its north but to a very limited degree. The landscape and winters tend to prohibit farming and the area is for peripatetic tribes and thus centres of civilisation for trade are probably non existent. Thus any attempt at drafting a map from this data is subjective, but at least we can infill the eastern borders of a world map as described by Paulus Orosius. 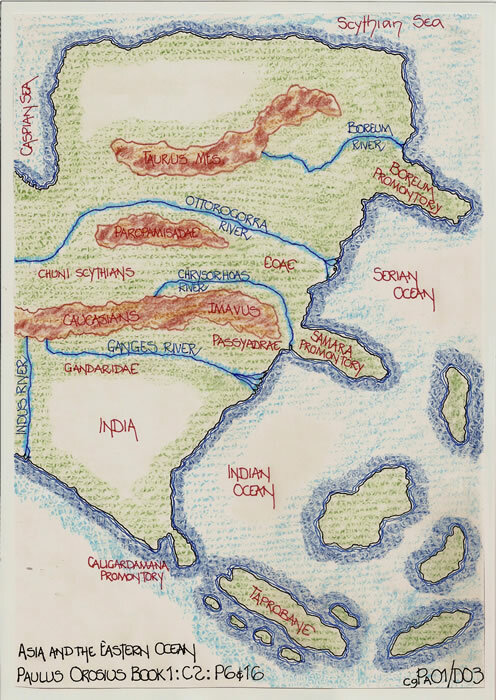 C2/7; In this region lies India, the western boundary of which is the Indus River, which empties into the Red Sea, and the northern boundary of which is formed by the Caucasian Range; the other sides, as I have said, are bounded by the Eastern and the Indian oceans. This land has forty-four peoples, not including either those who dwell on the island of Taprobane, which has ten cities, or those who live on the many other densely populated islands. C2/8; Between the Indus River on the east and the Tigris River, which lies to the west, are the following territories: Arachosia, Parthia, Assyria, Persida, and Media, by nature rough and mountainous lands. On the north they are bounded by the Caucasian Range, on the south by the Red Sea and the Persian Gulf, while in the centre flow their principal rivers, the Hydaspes and the Arbis. In these regions are twenty-three tribes. It is all commonly spoken of as Parthia, although the Sacred Scriptures often call the whole area Media. The Indus is certainly the western border of the Indian sub-continent, India itself, and here we read of the alternative name for the Arabian Sea, the Red Sea. No doubt this has caused geographers over the ages much confusion. The territories between the Indus and Tigris Rivers are correct but the river names are perhaps a confused reading of ancient texts. Ptolemy has placed the Arbis River in Gedrosia, a province adjacent to the River Indus not named by Orosius in his text. But in fact the Arbis is a tributary of the Indus flowing from Afghanistan and now known as the Cophen. There are very few major rivers in southern Iran known as a principal river, and in fact the Hydaspes River is also an upper tributary of the Indus River flowing south from the Punjab. 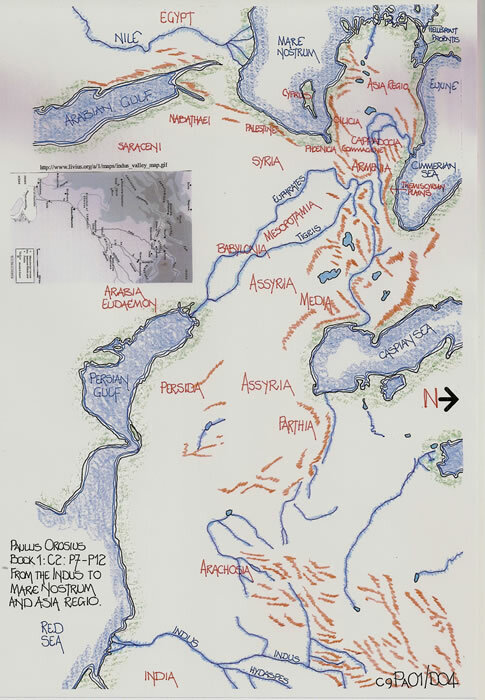 Thus it is probable Orosius has used the rivers of Arachosia, basically Afghanistan, and his comment “while in the centre flow” means the centre of the landmass he is describing which stretches from the Caspian Sea to the Arabian Gulf (Red Sea). C2/9; Between the Tigris and Euphrates rivers is Mesopotamia, beginning in the north between the Taurian and Caucasian ranges. To the south we meet in order, first Babylonia, then Chaldaea, and lastly Arabia Eudaemon, a narrow strip of land facing east and lying between the Persian and Arabian gulfs. Twenty-eight peoples live in these lands. One of the birth places of civilisation dismissed in a short paragraph. But here again we read of the name change of the Arabian Gulf to the Red Sea which is between Egypt and Arabia. C2/10; Syria is the name generally given to the land that extends from the Euphrates River on the east to Mare Nostrum on the west, from the city of Dagusa on the boundary between Cappadocia and Armenia near the place where the Euphrates rises on the north, as far south as Egypt and the end of the Arabian Gulf. This gulf extends southward in a long and narrow furrow which abounds with rocks and islands; from the Red Sea, that is, from the Ocean, it stretches in a westerly direction. The largest provinces of Syria are Commagene, Phoenicia, and Palestine, not including the lands of the Saraceni and the Nabathaei, whose tribe’s number twelve. Here Orosius has correctly described Syria as the landmass stretching from the Euphrates to the Mediterranean Sea and south to the Arabian Peninsula (his Arabia Eudaemon) with the Nabathaei and their capital of Petra hidden at the end of the enigmatic defile. The Arabian Gulf, our Red Sea is also correctly described and is the subject of the “Periplus of the Erythraean Sea”, a sailing manual for the coast of Arabia and Africa. C2/11; At the head of Syria is Cappadocia, which is bounded on the east by Armenia, on the west by Asia, on the northeast by the Themiscyrian Plains and the Cimmerian Sea, and on the south by the Taurian Mountains. Below these mountains lie Cilicia and Isauria extending as far as the Cilician Gulf, which faces toward the island of Cyprus. C2/12; Asia Regio, or, to speak more correctly, Asia Minor, exclusive of the eastern part where it touches Cappadocia and Syria, is surrounded on all sides by water; on the north by the Euxine, on the west by the Propontis and Hellespont, and on the south by Mare Nostrum. Here towers Mount Olympus. The two paragraphs cover the landmass of Anatolia, Asia Minor, with the Themiscyrian Plains in the northern central highlands between the Thermodon and Iris rivers, an area of abundance. In fact they are surrounded by mountains on all sides with the Euxine to the north (see C2/17 also). C2/13; Lower Egypt is bounded by Syria and Palestine on the east, by Libya on the west, by Mare Nostrum on the north, and by the mountain called Climax, Upper Egypt, and the Nile on the south. This river seems to rise from the shore where the Red Sea begins at the place called Mossylon Emporium. Thence it flows west for a long distance, forming in its midst the island called Meroe; finally, bending to the north, swollen by seasonal floods, it waters the plains of Egypt. Some authors say that it rises not far from Mount Atlas and gradually disappears in the sands, from which, after a short interval, it flows out into a vast lake and then glides eastward through the Ethiopian Desert toward the Ocean, and finally, turning to the left, flows down to Egypt. Of a truth there is a great river of this kind which has such an origin and such a course and which truly begets all the monsters of the Nile. The barbarians near its source call it the Dara, but by the other inhabitants it is called the Nuhul. This river, however, is swallowed up in a huge lake in the land of the people called Libyo-Egyptians, not far from the other river which, as we have said, rushes forth from the shore of the Red Sea, unless, as may be the case, it pours from a subterranean channel into the bed of that river which flows down from the east. 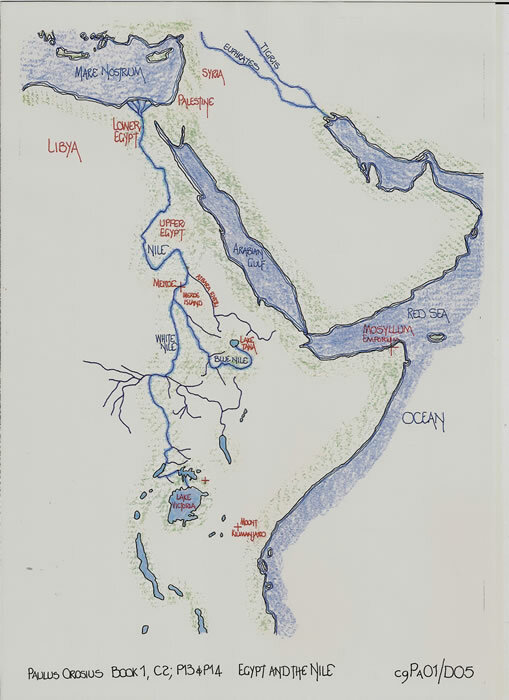 The idea of the Nile flowing from the east is contained in several ancient texts, although both Herodotus and Pliny state quite clearly that the source is not known. Mossylon Emporium is indeed situate at the mouth of the Arabian Gulf/Red Sea and features in the Periplus of the Erythraean Sea. Meroe, always noted as an island which is formed by the great rivers of Ethiopia, features again in most ancient texts. Orosius would have been fully aware of the Nile as he traversed the Egyptian littoral via the Delta, but perhaps only read or heard stories of its course and source. Text Es2 describes the Nile and its course. C2/14; Upper Egypt stretches far to the east. On the north is the Arabian Gulf, on the south the Ocean. On the west its boundaries begin at Lower Egypt, and on the east it is bounded by the Red Sea. In this region are twenty-four peoples. There is a confusion of geographical directions in this part of the text and Orosius is probably adding Nubia to the land of Egypt, but it was never a Roman territory. It was in ancient Egypt’s history part of greater Egypt which had Nubian Pharaohs’. But we must remember that there was a Roman expedition basically following the Nile. He may however have been looking at a map which was orientated, as many later maps, with East to the top or north position. 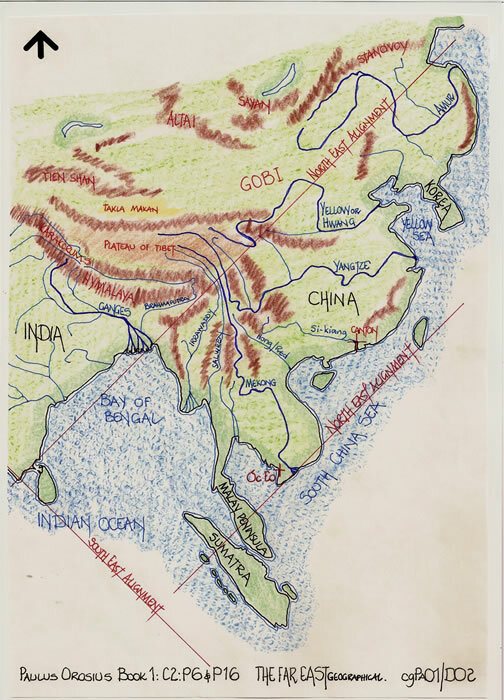 C2/15; Now that I have described the southern part of all Asia, it remains for me to take up the remaining lands, working from east to north. C2/16; The Caucasian Range rises first in the territories of the Colchi, who dwell above the Cimmerian Sea, and in the lands of the Albani, who live near the Caspian. Indeed, as far as its eastern extremity it seems to be one range, though it has many names. Some wish to consider these mountains part of the Taurian Range, because as a matter of fact the Parcohatras Range of Armenia, lying between the Taurian and Caucasian, is believed to form an unbroken chain with the other two ranges. The Euphrates River, however, proves that this is not the case, for, springing from the foot of the Parcohatras Mountains, it bends its course southward, veering constantly to the left, but keeping the Taurian Range on the right. The Caucasus in the territories of the Colchi and the Albani, where there are also passes, are called the Caucasian Mountains. From the Caspian passes to the Armenian Gates or to the source of the Tigris River, between Armenia and Iberia, they are called the Acroceraunian. From the source of the Tigris to the city of Carrhae between the Massagetae and the Parthi they are named the Ariobarzanes. From the city of Carrhae to the town of Cathippus, between the Hyrcani and the Bactriani, they are called the Memarmalian. There amomum grows in abundance. The nearest range to the Memarmalian is called the Parthau. From the town of Cathippus to the village of Saphri in the intervening lands of the Dahae, Sacaraucae, and the Parthyenae are the peaks of the Oscobares. The land area described is between the Black Sea and the Caspian Sea, part of which was under Roman control, but mostly the information comes from ancient Greek geographers and historians. It is in fact an excellent description. The Gates described are the passes across the various mountain ranges which had been used for centuries and are a feature of most itinerary texts. The land area stretches south to the Syrian border and thence eastwards to the Caspian Sea and Parthia. C2/17; The Caspian Sea rises from the Ocean in the northeast. The shores and the lands on both sides of it in the vicinity of the Ocean are considered to be desert and uncultivated. Thence, toward the south, the sea extends through a long channel, until, spreading out over a great area; it ends at the foothills of the Caucasian Mountains. In the lands from the Caspian Sea on the east, along the edge of the Northern Ocean as far as the Tanais River and the Palus Maeotis on the west, to the shores of the Cimmerian Sea on the southwest, and to the heights and passes of the Caucasus on the south, there are thirty-four tribes. The nearest region is usually called Albania, while the more distant territory near the sea and the Caspian Mountains is called the land of the Amazons. In the past the flooding of the Volga Delta and the hinterland may well have led to travellers considering it an inlet as the mouth is a vast area of water and flood plain. 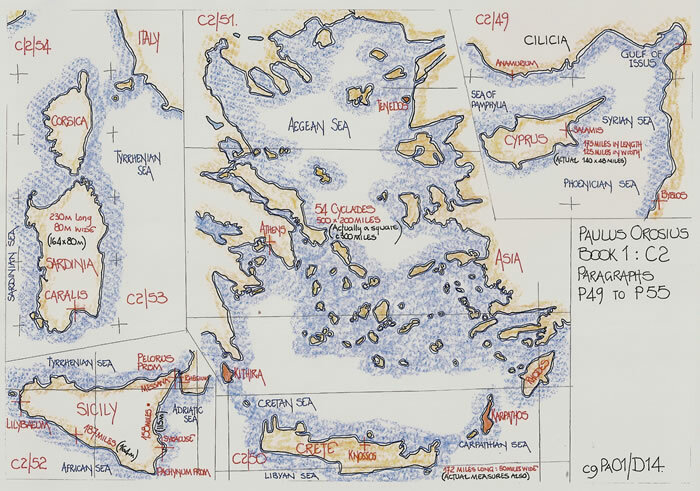 Herodotus tells that there is an island as large as Lesbos in the delta, but plainly states it is not connected to the ocean by an inlet (see cgHs1). The land around the northern portion of the Caspian Sea is by no means a desert, but mainly in that period uncultivated. It is the homeland of nomad hunters and animal herders. However to the east of the Caspian Sea the land varies considerably, but is mostly a salt desert which stretches south to the Karakum Desert, as text cgPl2 describes. The Amazons are a ‘fanciful’ race of female warriors to be found in ancient Greek literature and generally thought to have founded an empire on the River Thermodon, in Asia Minor, on the coast of the Black Sea. 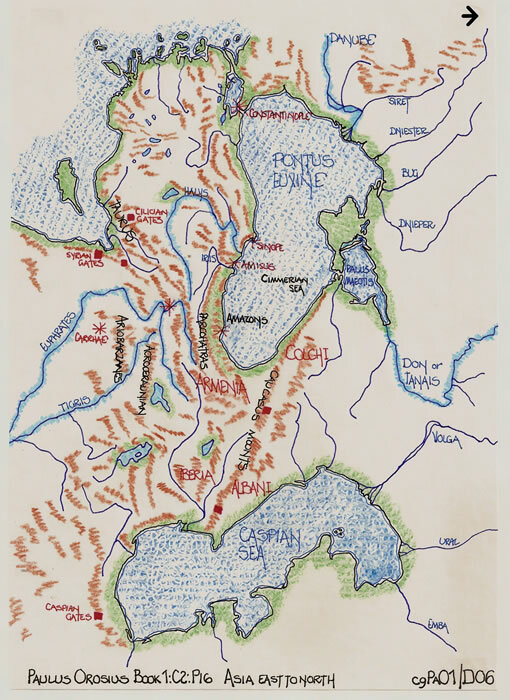 The Classical Gazetteer, page 344 states, ”A river of Pontus, rising in Paryadres mountains, SW of Thia, and enlarged in its course by 96 streams, falling into the Euxine below Themiscyra, 12 miles east from Heracleum promontory; Themiscyra is the chief seat of the Amazons.” It also gave its name to the plains in C2/P11. C2/18; The boundaries of Asia have been described as briefly as possible. Now I shall let my pen wander through Europe as far as it is known to man. C2/19; Europe begins at the Riphaean Mountains, the Tanais River, and the Palus Maeotis, all of which lie toward the east. Its territories extend along the shores of the Northern Ocean to Gallia Belgica and the Rhine River, which flows in from the west, and thence to the Danube. This last river is also called the Hister; it starts from the south, and, flowing to the east, empties into the Pontus. 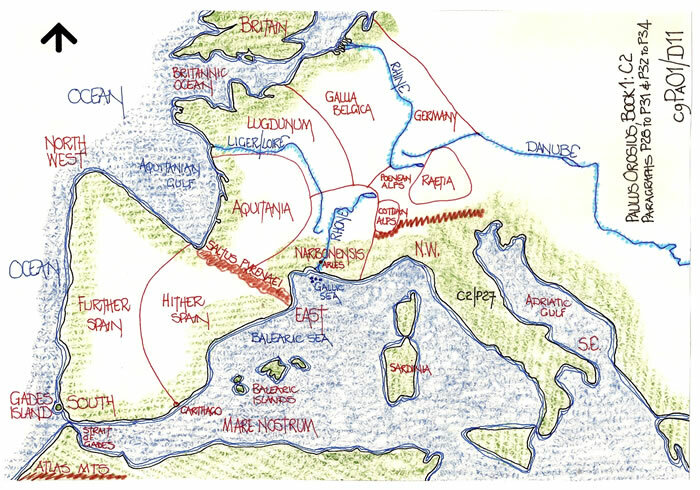 The lands of Europe in the East are first, Alania; in the middle, Dacia (there we also find Gothia); and finally, Germania, the main part of which is held by the Suebi. In all there are fifty-four tribes. This overall description which does not include the Scandinavian countries is out of date by the time Orosius is writing. The Roman Empire had extended into Germany. The Jutland Peninsula of Denmark, the Baltic Sea and certain rivers of the area were well known as indicated by the text of Claudius Ptolemy c150CE. Thus it is a text or cosmography of early date that Orosius is relying on for his general information and not an up to date collation. The Hister is the River Danube. 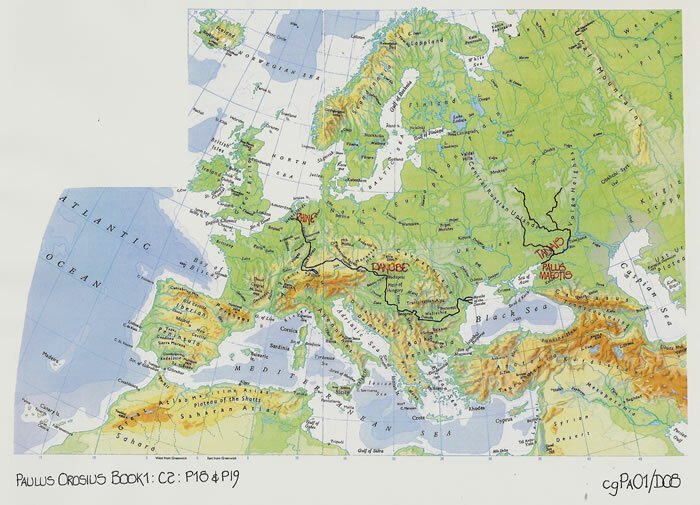 The text is confusing as he has stated, “the lands of Europe in the east are first Alania”, when he actually means it is the furthest east and thus the following countries named are each nearer in a westerly direction. 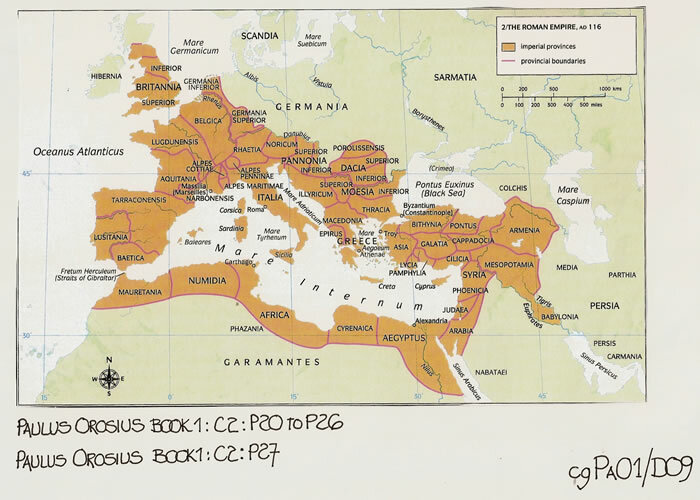 Orosius also omits many provinces between Dacia and Germania, although if he is merely stating east, centre and west, so be it. C2/20; Now I shall describe the lands between Mare Nostrum and the Danube, a river which separates these lands from the territories of the barbarians. C2/21; The boundaries of Moesia are on the east the mouth of the Danube River, on the southeast Thrace, on the south Macedonia, on the southwest Dalmatia, on the west Histria, on the northwest Pannonia, and on the north the Danube again. C2/22; Thrace is bounded on the east by the Gulf of Propontis and the city of Constantinople, which was formerly called Byzantium, on the north by part of Dalmatia and a gulf of the Euxine Sea, on the west and southwest by Macedonia, and on the south by the Aegean Sea. C2/23; The boundary of Macedonia on the east is the Aegean Sea, on the northeast Thrace, on the southeast Euboea and the Macedonian Gulf, on the south Achaia, on the west the Acroceraunian Mountains, lying on the narrows of the Adriatic Gulf opposite Apulia and Brundisium; to the west is Dalmatia, to the northwest Dardania, and to the north Moesia. C2/24; Achaia is almost entirely surrounded by water; its boundaries are the Myrtoan Sea on the east, the Cretan Sea on the southeast, the Ionian Sea on the south, the islands of Cephalenia and Cassiopa on the southwest and west, the Corinthian Gulf on the north. On the northeast a narrow ridge of land joins it to Macedonia, or rather to Attica. This place is called the Isthmus and on it is Corinth, which is not far distant from the city of Athens to the north. C2/25; Dalmatia is bounded on the east by Macedonia, on the northeast by Dardania, on the north by Moesia, on the west by Histria, the Liburnian Gulf, and the Liburnian Islands, and on the south by the Adriatic Gulf. C2/26; The boundaries of Pannonia, Noricum, and Raetia are on the east Moesia, on the south Histria, on the southwest the Poenean Alps, on the west Gallia Belgica, on the northwest the source of the Danube and the boundary that separates Germany from Gaul between the Danube and Gaul, and on the north the Danube and Germany. These are a roll call of the Roman Provinces at the time of Orosius. Some of the names are perhaps a little confused as they are both Greek and Roman. The whole can be shown on one diagram as an accurate statement of the age. It is also apparent that Orosius is using a cosmography probably dating to around c150CE (but not Ptolemy, possibly Pomponius Mela) when the Empire had expanded to its largest form. C2/27; The territory of Italy extends from the northwest to the southeast, having on the southwest the Tyrrhenian Sea, on the northeast the Adriatic Gulf. That part of Italy which borders on and forms one mass with the continent is walled in by the barriers of the Alps which rise from the Gallic Sea above the Ligurian Gulf. The Alps limit first the territories of the Narbonese and then Gaul and Raetia, until they sink in the Liburnian Gulf. Italy with Rome, “the City”, at its heart was the driving force of the Empire. But soon the split between east and west would occur and the rival empires fight for control. The Church however was to thrive. C2/28; Gallia Belgica has as its eastern boundaries the Rhine River and Germany; as its southeastern, the Poenean Alps; as its southern, the province of Narbo; as its western, the province of Lugdunum; as its northwestern, the Britannic Ocean; and as its northern boundary the island of Britain. C2/29; Gallia Lugdunensis, very long but extremely narrow, half surrounds the province of Aquitania. On the east it is bounded by Belgica and on the south by part of the province of Narbo, where the city of Arles is situated and the Rhone River empties into the Gallic Sea. C2/30; The province of Narbo, a part of the Gauls, is bounded on the east by the Cottian Alps, on the west by Spain, on the northwest by Aquitania, on the north by Lugdunum, on the northeast by Belgica Gallia, and on the south by the Gallic Sea, which lies between Sardinia and the Balearic Islands. The Stoechades Islands lie in front of the southern coastline of this province, where the Rhone River empties into the sea. C2/31; The province of Aquitania is formed into a circle by the slanting course of the Liger River, which for almost its entire length serves as a boundary of the province. On the northwest the province touches that ocean which is called the Aquitanian Gulf; to the west it borders on Spain, to the north and east on Lugdunum, and to its southeast and south lies Narbo. The four (or should it be three) provinces of Gallia or France are certainly as named but their shape as described is a little awry, and certainly Aquitania is problematic. That is reflected in the description that Orosius gives to his homeland of Iberia (Spain). To understand the description it is necessary to plot each part of the map and then join it to the map of the Iberian Peninsula (see CgPa01D11), where it may account for the comments by some ancient geographers that the Pyrenees are a north south mountain range. C2/32; Spain, taken as a unit, is formed by its natural contour into a triangle and is almost an island owing to the fact that it is surrounded by the Ocean and the Tyrrhenian Sea. Its first corner, facing east, is walled in on the right by the province of Aquitania and on the left by the Balearic Sea, and is wedged in next to the territories of the Narbonese. The second corner extends toward the northwest. There in Gallaecia is situated the city of Brigantia, which raises its towering lighthouse, one of the few notable structures in the world, toward the watchtower of Britain. Its third corner is at the Gades Islands, which face to the southwest and look toward the Atlas Mountains across the intervening gulf of the ocean. C2/33; The Saltus Pyrenaei forms the boundary of Hither Spain, beginning on the east and extending on the northern side as far as the territory of the Cantabri and the Astures; from this point on through the territory of the Vaccaei and Oretani, which lies to the west, Carthage, which is situated on the coast of Mare Nostrum, determines the boundary. C2/34; Further Spain has on the east the Vaccaei, Celtiberi, and Oretani; on the north and west the Ocean; and on the south the Strait of Gades. This strait belongs to the Ocean, and through it Mare Nostrum, which is called the Tyrrhenian Sea, enters. The description of Spain, coming from a learned person who was born in Spain, is totally at odds with geographical fact. Even Agrippa in 12BCE describes Spain as a basic square. A triangle it most certainly is not, and does not appear as such in a text or cosmography from the same age, but, there are sufficient discrepancies within the texts of those geographers to warrant an examination. It also provides a reason to compare this description to the Tabula Peutingeriana (unfortunately the lost section) which could be considered to have shown that Iberia had a North-western, Southern and Eastern corner with the Pyrenees sloping to the North West. 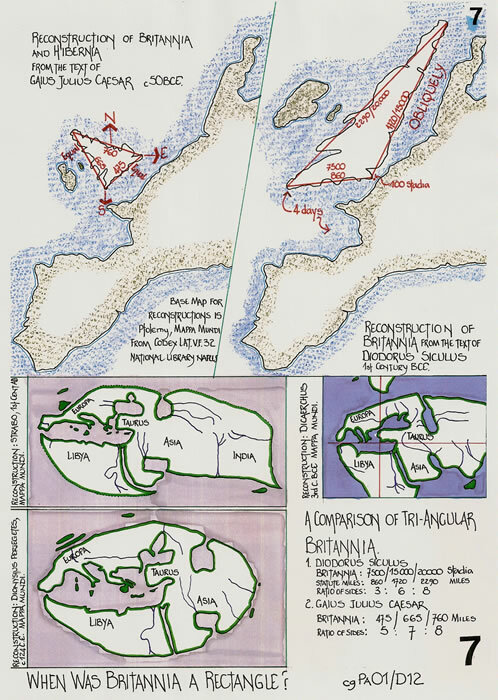 My text Tp1 has a reconstruction of the lost portion, but it is most certainly not with a triangular Iberian peninsula which would not accord to the Tabula’s format. Para 4 states,” The Sacred Cape most westerly point not only of Europe but of the whole inhabited world.” And,” Moreover, the country adjacent to this cape they call in the Latin language “Cuneus” meaning thereby to indicate its wedge shape. Having chosen the ox-hide, Strabo has elongated the Iberian Peninsula and re-oriented geographical fact to fit that shape. But, his text is positive concerning the Pyrenees which he wrongly believes are a north/south alignment. As stated this is contrary to the map of Agrippa which he has knowledge of, and Pliny clearly indicates that Iberia is a SQUARE, the geographical fact. Pomponius Mela writing just after Strabo has this to say, “B1/C18, Spain stretches, with differently situated coastlines, to the west and also for a long time to the north. B2/C85, the Pyrenees, to begin with, extend from here (Cervaria/Cerbere in Gaul) to the Britannic Ocean. Then, after shifting direction, the range bursts into the lands of Spain, and excluded from its smaller division to the right, it protracts its continuous sides in an uninterrupted path until it reaches the western shores after crossing the entire province in a single dividing line. B2/C86, Spain actually is girt by the sea except where it is contiguous with Gaul, and it is especially narrow at the places of contact. Spain extends gradually into our sea and Ocean, and becoming increasingly wider the further west it goes, it becomes widest right there”. Thus Mela intimates a geographical profile for the Iberian Peninsula, certainly not a triangle. The only other contemporary geographers are Marinus the Tyrian and Claudius Ptolemy, who from their co-ordinate system provides us with a very reasonable geographic profile for Iberia. C2/35; Inasmuch as there are in the Ocean islands called Britain and Ireland, which are situated opposite the Gauls in the direction of Spain, they will be briefly described. C2/36; Britain, an island in the Ocean, extends a long distance to the north; to its south are the Gauls. The city called Portus Rutupi affords the nearest landing place for those who cross the water. From this point Britain faces directly the territories of the Menapi and Batavi, which are located not far from the land of the Morini in the south. This island is eight hundred miles long and two hundred miles wide. C2/37; In the limitless ocean which stretches behind Britain are the Orcades Islands, of which twenty are deserted and thirteen inhabited. C2/38; Next comes the island of Thule, which is separated from the others by a great space and is situated in the middle of the Ocean toward the northwest; it is known to only a few. C2/39; Ireland, an island situated between Britain and Spain, is of greater length from south to north. Its nearer coasts, which border on the Cantabrian Ocean, look out over the broad expanse in a southwesterly direction toward far-off Brigantia, a city of Gallaecia, which lies opposite to it and which faces to the northwest. This city is most clearly visible from that promontory where the mouth of the Scena River is found and where the Velabri and the Luceni are settled. Ireland is quite close to Britain and is smaller in area. It is, however, richer on account of the favorable character of its climate and soil. It is inhabitated by tribes of the Scotti. C2/40; The island of Mevania, its next door neighbour, is itself fair sized and possesses a rich soil. It, too, is inhabited by tribes of the Scotti. C2/41; These are the boundaries of all the countries of Europe. This description of Britannia and Ireland appears to be taken from a map or cosmography where the two islands are shown tilted westerly such that Ireland is north-east of Iberia. This agrees with the notion Orosius infers earlier that Iberia is sloping to the north-west. It is therefore logical to suppose that the map may have had a circular frame such that with the removal of a square north-west corner these lands required to be tilted to fit the circular shape. He also uses the measurements for Britannia attributable to Agrippa, 800 x 300 miles and is therefore using perhaps a copy of the map attributable to Agrippa also. However, Britannia has many forms as the texts illustrate. C2/43; After Egypt, the next province of Africa that I shall describe is Libya Cyrenaica and Pentapolis. This region begins at the city of Paraetonium and the Catabathmon Mountains, from which, following the sea, it extends as far as the Altars of the Philaeni. The territory behind it, which reaches to the Southern Ocean, is inhabited by the Libyo-Ethiopian and Garamantian peoples. Egypt is on the east, the Libyan Sea on the north, the Greater SyrtisÂ and the country of the Troglodytes on the west (opposite the Troglodytes is the island of Calypso), and the Ethiopian Ocean on the south. C2/44; The province of Tripolis is also called Subventana or the country of the Arzuges, as these people are generally called throughout the length and breadth of Africa. In this province the city of Leptis Magna is situated. Tripolis is bounded on the east by the Altars of the Philaeni which are between the Greater Syrtis and the country of the Troglodytes, on the north by the Sicilian Sea, or rather by the Adriatic, and the Lesser Syrtis, on the west by Byzacium as far as the Lake of Salinae, on the south by the lands of the barbaric Gaetuli, Nathabres, and Garamantes, whose territories stretch as far as the Ethiopian Ocean. C2/45; Next are the provinces of Byzacium, Zeugis, and Numidia. To begin, Zeugis is not the name of one conventus, but we find that it was the general name of a whole province. Byzacium, then, with the city of Hadrumetum, Zeugis with Magna Carthago, Numidia with the cities of Hippo Regius and Rusiccada, are bounded on the east by the Smaller Syrtis and the Lake of Salinae, and on the north by Mare Nostrum, which faces toward the islands of Sicily and Sardinia. These provinces are bounded on the west by Mauretania Sitifensis and on the south by the Uzarae Mountains behind which the Ethiopian peoples wander about as far as the Ethiopian Ocean. C2/46; Mauretania Sitifensis and Mauretania Caesariensis border to the east on Numidia, to the north on Mare Nostrum, to the west on the Malva River, to the south on Mount Astrixis, which separates the fertile soil from the sands that stretch as far as the Ocean. In this desert the Gangines Ethiopes roam. C2/47; Mauretania Tingitana is the last part of Africa. This region is bounded on the east by the Malva River, on the north by Mare Nostrum as far as the Strait of Gades which is confined between the two opposite promontories of Abyla and Calpe, on the west by the Atlas Range and the Atlantic Ocean, on the southwest by the Hesperian Mountains, on the south by the territory belonging to the tribes of the Autololes, who are now called Galaules and who inhabit the lands which extend as far as the Western Ocean. The description is perhaps rather strange in its order, bearing in mind Paulus Orosius travelled from Iberia/Hispania to Alexandria, which is west to east and his text description is east to west. He has chosen to use the latest Christian sub-divisions of the North African Littoral and pepper the text with ancient sites and names for the inhabitants. Basically North Africa was never more than the littoral from Mare Nostrum to the start of the sands and/or the mountainous areas of the hinterland. The Romans had large colonies and farming areas particularly in Tunisia, the area Paulus Orosius mentions as Byzacena, but the landscape is best described by “Pentapolis” and “Tripolitania”. After the two Syrtis the littoral is populated to a greater extent and the land between Mare Nostrum and the Atlas Range used for agriculture, with many Poleis along the coastline and in the interior as the Tabula Peutingeriana and the Itinerarum Antonini attest. Even the west coast to the Atlantic Ocean was populated. C2/48; This is the boundary line of the whole of Africa. Now I shall set forth the locations, names, and sizes of the islands which are in Mare Nostrum. C2/49; The island of Cyprus is surrounded on the east by the Syrian Sea which people call the Gulf of Issus, on the west by the Sea of Pamphylia, on the north by Aulon of Cilicia, and on the south by the Syrian and Phoenician seas. In extent it is one hundred and seventy-five miles in length and one hundred and twenty-five miles in width. C2/50; The island of Crete is bounded on the east by the Carpathian Sea, on the west and north by the Cretan Sea, on the south by the Libyan Sea, which people also call the Adriatic. It is one hundred and seventy-two miles long and fifty miles wide. C2/51; The islands of the Cyclades are these: the first, on the east, is Rhodes, then on the north Tenedos, on the south Carpathus, and finally on the west Cythera. These islands are bounded on the east by the shores of Asia, on the west by the Icarian Sea, on the north by the Aegean Sea, and on the south by the Carpathian Sea. The entire number of the Cyclades is fifty-four. These islands extend from north to south five hundred miles, from east to west two hundred miles. C2/52; The island of Sicily has three promontories: the first, called Pelorus, faces toward the northeast, and its nearest city is Messana; the second, called Pachynum, on which is the city of Syracuse, faces toward the southeast; the third, called Lilybaeum, is inclined to the west and on it is a city of the same name. The distance from Pelorus to Pachynum is one hundred and fifty-eight miles, and that from Pachynum to Lilybaeum one hundred and eighty-seven miles. Sicily is bounded on the east by the Adriatic Sea and on the south by the African Sea, which is opposite the land of the Subventani and the Lesser Syrtis. On the west and on the north it is bounded by the Tyrrhenian Sea, which extends on the north as far as the eastern strait of the Adriatic Sea. This strait divides the lands of the Tauromenitani in Sicily from those of the Bruttii in Italy. C2/53; The islands of Sardinia and Corsica are divided by a small strait twenty miles in width. The southern part of Sardinia, which faces Numidia, is inhabited by the Caralitani; its northern part, which faces the island of Corsica, by the Ulbienses. Sardinia is two hundred and thirty miles long and eighty miles wide. To the east and northeast of the island is the Tyrrhenian Sea, which faces toward the harbor of the city of Rome, to the west the Sardinian Sea, to the southwest the Balearic Islands situated far away, to the south the Numidian Gulf, and to the north, as I have said, Corsica. C2/54; The island of Corsica has many corners because of its numerous promontories. This island, bounded on the east by the Tyrrhenian Sea and harbor of the City, on the south by Sardinia, on the west by the Balearic Islands, and on the northwest and north by the Ligurian Gulf, is one hundred and ten miles long and twenty-six miles wide. C2/55; There are two Balearic Islands, the larger and the smaller. On each of these are two towns. The larger island, toward the north, faces the city of Tarraco in Spain; the smaller, the city of Barcelona. The island of Ebusus lies near the greater. On the east these islands face Sardinia, on the northeast the Gallic Sea, on the south and the southwest the Mauretanian Sea, and on the west the Iberian Sea. C2/56; These then are the islands situated in the waters of the entire Great Sea from the Hellespont to the Ocean, which because of their culture and history, are considered more famous. We can utilise the text of Pliny the Elder to give comparative dimensions for the islands which have been outlined by Paulus Orosius. Pliny Book 3: C12, Corsica; in the Ligurian Sea, but close to Tuscan, is Corsica, by the Greeks called Cyrnos, extending from north to south 150 miles and for the most part 50 miles in breadth, its circumference being 325 miles. Pliny Book 3: C13, Sardinia; extends upon the east side a distance of 188 miles, on the west 175, on the south 77 and on the north 125, being 565 miles in circumference. Its promontory of Caralis is distant from Africa 200 and from Gades 1400 miles. Pliny Book 3: C14, Sicily; but more celebrated than all is Sicily, called Sicania by Thucydides, and by many writers Trinacria or Trinacia, from its triangular appearance. According to Agrippa it is 618 miles in circumference. In former times it was a continuation of the territory of |Bruttium, but, in consequence of the overflowing of the sea, became severed from it; thus forming a strait of 15 miles in length, and a mile and a half in width in the vicinity of the Pillar of Rhegium. It was from this circumstance of the land being severed asunder that the Greeks gave the name of Rhegium to the town situate on the Italian shore. In these straits is the rock of Scylla, as also Charybdis, a whirlpool of the sea, both of them noted for their perils. Of this triangle, the promontory, which, as we have already mentioned, is called Pelorus, faces Scylla and juts out towards Italy, while Pachynum extends in the direction of Greece, Peloponnesus being at a distance from it of 440 miles, and Lilybaeum, towards Africa, being distant 180 miles from the promontory of Mercury, and from that of Caralis in Sardinia190. These promontories and sides are situate at the following distances from each other: by land it is 186 miles from Pelorus to Pachynum, from Pachynum to Lilybaeum 200, and from Lilybaeum to Pelorus 170. Pliny Book 4: C20, Crete; in breadth it nowhere exceeds 50 miles, being widest about the middle. In length however it is full 270 (sic) miles and 589 in circumference. C2/57; I have completed my survey of the provinces and islands of the whole world as briefly as I could. Now, so far as I am able to give them, I shall make known the local disasters of individual nations as they arose in an unending stream from the beginning, and I shall discuss their nature and their origin as well. The following text is a précis of the completion of Book 1 by Paulus Orosius, and illustrates the main purpose of the text, that Christianity was not to blame for the ills of the world. Chapter numbers are my guides in the preceding section but these following are of the original text. 3. After the fashioning and adornment of this world, man, whom God had made upright and immaculate, became defiled by sin ———. I shall make this reservation: if pagan historians have discussed these subjects, we shall extend our account to cover their treatment. 4. One thousand three hundred years before the founding of the City, Ninus, the first king of the Assyrians, as my opponents wish him to be considered, was led on by his lust for dominion to wage wars abroad. For fifty years he maintained a reign of bloodshed throughout all Asia. Starting from the south and from the Red Sea, he laid waste and subjugated the territory in the extreme north along the Euxine Sea. He taught barbaric Scythia, hitherto an unwarlike and inoffensive country, to quicken into action her dormant spirit of ferocity, to become conscious of her strength, to drink not as heretofore the milk of domestic animals but the blood of men, and in the end to conquer even as she was being conquered. Finally he engaged in battle with Zoroaster, the king of the Bactrians, and after defeating him slew him. This was the same man who they say invented the art of magic. Later Ninus himself, while storming a rebellious city, was struck by an arrow and died. His wife Semiramis succeeded him on the throne. 5. Tacitus, too, among others, mentions that one thousand one hundred and sixty years before the founding of the City the region which bordered on Arabia and which at that time was called Pentapolis was burnt, even below its surface, by a fire from heaven. This is what he says: "Not far from there lie the plains, which, they say, were once fertile and were the sites of great cities, but which later were burnt by lightning. It is said that traces of this disaster still remain, but that the earth itself, which looks fruitful, has lost its powers of fertility." Although at this point, as if he were unaware of it, he said nothing about cities having been burnt because of the sins of mankind, yet a little later, as if he had forgotten his purpose, he adds this statement: "For my own part, although I am willing to admit that those famous cities of old were destroyed by fire from heaven, yet I still hold the opinion that it was the exhalations from the lake that infected and poisoned the land." By this statement he has admitted, although loath to do so, that he had known and agreed with me about the burnt cities, which undoubtedly were destroyed by fire as a punishment for their sins. Thus he has openly proved that he did not lack a trustworthy source of knowledge but merely a willingness to express his belief. I will now explain this more fully. On the border of Arabia and Palestine, where the mountains, as they disappear on each side, merge into the fields which here below them, were five cities “Sodom, Gomorrah, Adama, Soboim and Segor. Of these, Segor was small, whereas the others were large and spacious. For the soil near these cities was fertile, and the Jordan River spreading out through the plains and dividing them into convenient sections, served to increase the productivity of the land. The sea has flowed over and at the present time covers the middle of the valley that the Jordan once watered. So great was God’s displeasure, aroused by matters which the inhabitants had held to be petty, that, because the people had misused their blessings and turned the fruits of His mercy to the nourishment of their passions, the very land itself, on which these cities were built, was first burnt by fires, later overwhelmed by waters, and finally vanished from the sight of men into eternal condemnation. 6. Therefore, he has punished sinners, in what way He can punish them, and in what way He will punish them. 7. One thousand and seventy years before the founding of the City, the Telchines and Caryatii fought a stubborn battle against Phoroneus, king of the Argives, and against the Parrhasians. The course of the struggle fluctuated, and the battle ended without decision. In a battle shortly afterward, these Telchines were defeated and fled from their native land; ignorant of the true state of affairs they seized the island of Rhodes, which was earlier called Ophiussa, in the belief that it was a place of safety and that they were cutting themselves off completely from contact with the whole civilized world. One thousand and forty years before the founding of the City, a raging flood brought great destruction upon almost all the province of Achaia. Inasmuch as this flood took place in the days of Ogygius, who was the founder and king of Eleusis at this time, it was he who gave the name to the place and to the era. Such then is Justin’s statement. Although the histories and registers are silent, nevertheless the land of Egypt itself is a witness which offers evidence of that age. In those days the country was brought under the king’s power and was restored to its own cultivators; from that time to the present day, it has regularly paid a tax of a fifth part of its entire produce. It was during the reign of the king Diopolita, whose name was Amasis, that the great famine came to Egypt. This was also the time that Baleus was ruling over the Assyrians and Apis over the Argives. The seven years of famine, however, were preceded by seven years of plenty. Exercising his usual shrewdness, our Joseph collected and stored the surplus of these years. This surplus ordinarily would have perished through neglect in proportion to the bountifulness of the crop. He thus saved all Egypt. He amassed all the money for Pharaoh and all the glory for God, rendering, by his just stewardship, "tribute to whom tribute was due and honour to whom honour." He acquired the flocks, lands, and wealth of all, in accordance with a fixed agreement with them; and in return for a fifth of their property he released those who had sold both themselves and their lands in exchange for a grant of [grain]. Who would believe that this Joseph, whom God had placed over the Egyptians as the author of their deliverance, should have been so quickly forgotten that a little while later the Egyptians would condemn his sons and entire kinship to slavery, would inflict hardships upon them, and would crush them by massacres? Hence we must not be astonished if there are some men in our own age who, though they would remove the sword hanging over their necks by pretending to be Christians, either never mention or else defame the very name of Christ, through whom alone they are saved, and maintain that they are sorely oppressed in Christian times. In reality they are made free by the benefits which these times confer upon them. 9. Eight hundred and ten years before the founding of the City, Amphictyon, the third king after Cecrops, reigned at Athens. In his time a flood carried away most of the population o Thessaly, although some were saved by taking refuge on the mountains, especially on Mount Parnassus, whose environs were then ruled over by Deucalion. Because he supported and fed the refugees who came to him on rafts and who were resting upon the twin ridges of Parnassus, Deucalion is said to have saved the human race. Plato is a witness that in those days numerous plagues and terrible diseases afflicted Ethiopia and reduced the population almost to a state of desolation. 10. Pompeius and Corneliu bear witness to the fact that in the eight hundred and fifth year before the founding of the City the Egyptians were oppressed by unspeakable evils and intolerable plagues. 11. During the seven hundred and seventy-fifth year before the founding of the City in the course of the quarrel between Danaus and his brother Aegyptus, the daughters of the former murdered the fifty sons of the latter. 12. But I am forced to confess that in the interest of anticipating the end of my book, I have left out many details concerning the evil conditions of the age and have abbreviated everything, since in no way could I have ever passed through so thick a forest of evils unless I had hastened my journey by frequent leaps. Inasmuch as the Assyrian kingdom was governed by about fifty kings and was hardly ever at peace during the one thousand one hundred and sixty years that elapsed before the reign of Sardanapalus (offensive and defensive wars were always being waged) what purpose will be served if I attempt to recall these events by enumerating them, to say nothing of describing them? This is especially so since I must discuss the deeds of the Greeks, and above all I must survey those of the Romans. Neither is there any need for me to recount the disgraceful deeds of Tantalus and Pelops, which are even more disgraceful when told. You will recall how the Phrygian king Tantalus most scandalously seized Ganymedes, the son of Tros, king of the Dardanians, and how he took him into his disgusting embrace. The poet PhanoclesÂ confirms the story and also mentions the fact that a great war arose on this account. Perhaps Phanocles tells this story because he wished this same Tantalus to appear as the servant of the gods when he corrupted the stolen boy in his own home in order to prepare him for the lust of Jove. Tantalus, indeed, did not hesitate to employ at Jove’s banquets even his own son Pelops. 13. In the five hundred and sixtieth year before the founding of the City the Cretans and Athenians engaged in a bitter struggle in which both sides suffered disastrous losses. 14. Four hundred and eighty years before the founding of the City, Vesozes, the king of Egypt, eager to engage in war with the South and the North (regions separated by almost the whole heaven and the whole sea) or to annex them to his kingdom, first declared war upon the Scythians. 17. But four hundred and thirty years before the founding of the City, the abduction of Helen, the covenant of the Greeks, the assembly of a thousand ships, then the ten years’ siege, and lastly the celebrated destruction of Troy, is well known to all. 18. Moreover, in the next few years came the events that followed the arrival of Aeneas in Italy after he had fled from Troy, that is, the strife he aroused, the kinds of wars he provoked over a period of three years, and the number of peoples he involved in hatred and ruthlessly overthrew. 19. In the sixty-fourth year before the founding of the City, Sardanapalus reigned over the Assyrians. He was their last king and a man more corrupt than a woman. 20. At that time Phalaris the Sicilian set up a tyranny and began to plunder the people of Agrigentum. 21. Thirty years before the founding of the City, the Peloponnesians and the Athenians waged a great war into which both peoples entered with their full strength and enthusiasm. Each side was finally forced by mutual destruction to withdraw from combat and to terminate the war, as if both had been defeated. At this time a tribe of Amazons, accompanied by the Cimmerians, made a sudden incursion into Asia and wrought severe, prolonged, and widespread devastation and carnage. [§5]* All the islands of the sea also, the Cyclades, Sporades, Ionian isles, Echinades, the Tuscan isles, the Balearic isles, and all the rest in Libyan, Ionian, Egyptian, Myrtoan, Sicilian, and Mediterranean waters, by whatever names called; also those which the Greeks by way of distinction call the great islands, Cyprus, Crete, Rhodes, Lesbos, Euboea, Sicily, Sardinia, and Corsica, and whatever other isle there may be, large or small – all are under Roman rule. Crossing the Northern Ocean to Britain, a continent in itself, they took possession of the better and larger part, not caring for the remainder. Indeed, the part they do hold is not of much use to them. As a geographer, Orosius provided what was perhaps the single most influential delineation of the known world until the Origines of Isidore of Seville two centuries later, and Isidore himself was heavily indebted to the work of his exiled compatriot. It is the purpose of this chapter, however, and of this study as a whole, to investigate the third great legacy of Orosius’ literary output – the relationship that he established between the complementary disciplines of geography and historiography. Orosius was not the first writer to compose a piece that was as thoroughly infused with spatial and temporal themes on an almost equal footing, but his analysis of the world proved to be paradigmatic in the centuries that followed his death. If the Spanish historian provided an influential summary of earlier attitudes to the world, it was argued he added little innovation to a discipline that had been in decline since the eclipse of Greek mathematical geography in the second century. Orosius’ geographical chapter, it must be remembered, was not composed in isolation. An expanded form of the chapter does seem to have circulated in the fifth century as a stand-alone text, but Orosius’ original chapter was primarily intended as a single chapter within a much larger historical composition. Detailed analysis of the chapter itself is essential to the understanding of Orosius’ geographical methodology, but so too is an appropriate appreciation of the writers historical emphases. Throughout the piece, the importance of the terrestrial world to Orosius’ understanding of human history is clearly evident. The geographical introduction itself was intended, not as a simple delineation of the world upon which the later narrative would be set, but rather as an implicit demonstration of the breadth of the Christian world, and the limitations of the mundane kingdoms that had come before it. Orosius’ own cultural background limited him to certain established models in the calculation of time and the depiction of space, and deference to classical authorities is readily apparent throughout his work. Nevertheless, within the geographical chapter in particular, the writer proves himself to be an enthusiastic challenger of ruling paradigms, and devotes particular attention to those regions which had perplexed or defeated the geographers of classical antiquity. In his solution to the perennial problems of the continental division of the world, and in his fearless depiction of the Nilotic headwaters, the Caucasus Mountains and the isles of the Northern Ocean, Orosius effectively posited a new model of geographical writing. 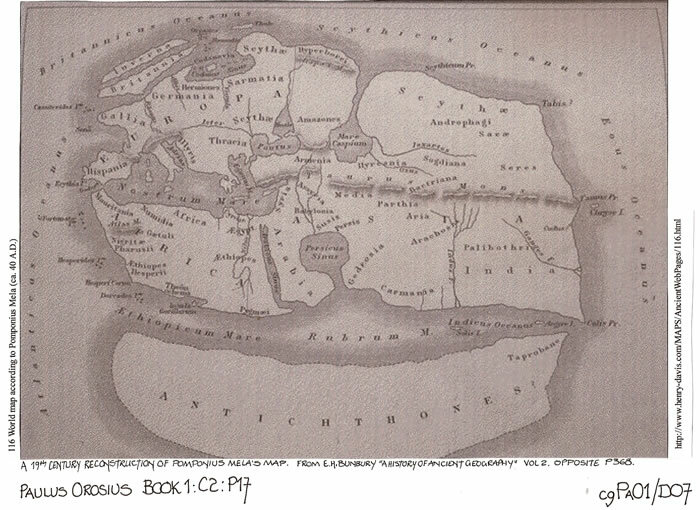 In place of the well-described centre and hazy periphery long-familiar from classical geography, Orosius depicted a world in which all parts were equally clear. As the centuries that followed demonstrate, the significance of Orosius’ opening chapter was twofold. Crucially, Orosius created an image of the world upon which later Christian writers, in all disciplines could draw. His authoritative geography supplanted the work of Solinus and rivaled the later writings of Martianus Capella as the principal source for the description of the world. He provided a more succinct geography than that available in Orosius. The work of Paulus Orosius can be shown to have had an enormous effect upon the later Christian writers and their map makers. From the 6th century there was little geographical/cartographical work that was not from a monastic establishment and this new mapping culminated with the Mappae Mundi, those round maps of the world, oriented East. “Another formulation of medieval knowledge was Paulus Orosius who wrote a history, “Seven Books against the Pagans”, in the early 5th century. An associate of St. Augustine, he was commissioned to write a book showing that Christians were by no means responsible for the catastrophes of world history (as had been charged) but that many more disasters had taken place under pagan rule. He opened his book with an overview of the physical and political world, which was often copied separately. He is not cited directly on the Hereford Map but is given credit for the whole work in the lower right hand corner in an inscription which reads, “Descripio orosii de ornesta mundi-sicut interius ostenditur” ( Orosius’ account of the “ornesta” of the world, as shown within). “Ornesta,” usually “Ormista” is the collapsed version of “Orosii mundi istoria”, (Orosius’ world history).His theme, “the manifestation of divine providence in the vicissitudes of human history, eventually leading to the triumph of the true faith”, was certainly compatible with the visual presentation of the Hereford Mappa mundi. The texts of Strabo, Pliny the Elder, Sallust, Appian and of course Paulus Orosius are available on line. 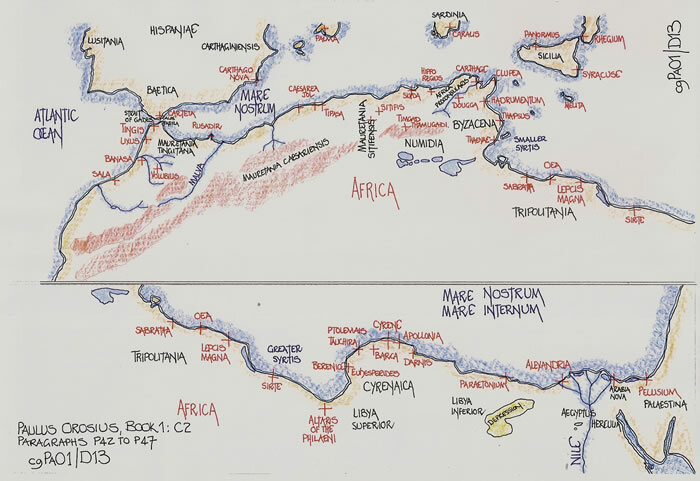 J.Lennart Berggren and Alexander Jones, 2000; “Ptolemy’s Geography, an annotated translation of the theoretical chapters”, published by Princeton University Press. “Dicuili, Liber De Mensura Orbis Terrae”; edited by J J Tierney, 1967. Published by The Dublin Institute for Advanced Studies. Claude Nicolet, 1991, “Space Geography and the Politics in the Early Roman Empire”, published by The University of Michigan Press. C. Vellius Paterculus, “The Roman History”, originally published by Loeb Classical Library, 1924 and now on line at Lacus Curtius/Thayer, along with the Strabo, Pliny and Sallust texts.